I spend about a fourth of my time in the building that is hosting THATCamp, so I’d like to share a few tips for guests to campus. First, since things are a little slower during the summer, you can probably save a few bucks on parking by checking out some of the neighborhood streets. 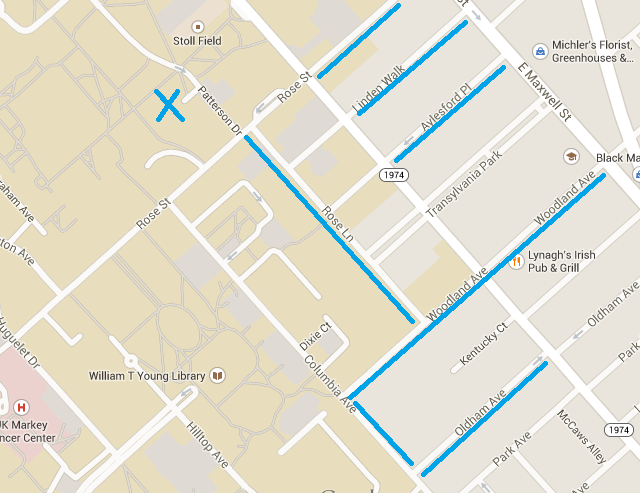 The X is the Little Library, and the blue lines run along streets with free parking. Just make sure you’re not in the yellow paint areas. If you’re looking to get a cup of coffee, you can visit the Starbucks in the Student Center from 7:30 to 3:00 and Young Library from 8:00 to 2:00 pm. I’ve never actually measured the distance, but the Student Center feels closer to Little than Young. There’s also a little cafe just a few buildings over in the Office Tower with some good self-serve options. We have vending machines on the third floor. Use of the Niles Gallery includes access to a microwave and refrigerator. The library can loan you a locker if you want to stash anything between camp sessions. 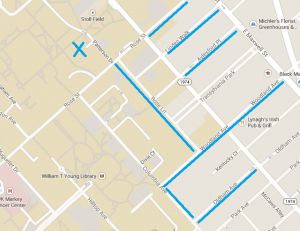 If you’re within a stone’s throw of a campus building, you can typically get a wireless signal from the ukyedu network. If you have any random questions about campus or the library system, please feel free to send them my way at ude.y1555764408ku@sa1555764408an.le1555764408inad1555764408. Please feel free to comment on our planning document we did today, even if you weren’t here. Let’s get serious and figure out where to go this evening after our brainstorming of the agenda! What about West Sixth Brewery (www.westsixth.com/our-location/)? There’s a wonderful seafood takeout next door for when we get hungry (smithtownseafood.com/). What do you say? 2. And to build on Laura Bowles’ suggestions in “Play: Free Digital Tools for Research,” I think we might even be able to break the types of work she suggested out into separate sessions (i.e., research, collaborate, present). I can imagine very lively sessions based on each of these 3 activities. Are others flipping their classrooms? If so, how have you done this? What has worked well and what has not? I’m interested to hear about the LMS/CMS different people/schools use. I’ve had experience with Blackboard, WebCT, and Moodle, but I tend to find myself wanting to wander away from the university-sanctioned option and use WordPress to create my own course shell. This conversation would likely touch on larger questions like, What is the purpose of a LMS/CMS? How do we weigh the benefits and drawbacks of hiding our class materials behind a required username and password? How do/should these spaces mimic or integrate with other digital spaces students use? In what ways might these spaces be burdensome or difficult for students and faculty? How are we using mobile technology, perhaps specifically apps, in our research and teaching (which apps, how are we using them, what are some best practices? etc.)? What have we most recently learned from our students about technology (about what tools they use, about how they understand technology, etc.)? 4. A question I have (so not something I would be comfortable leading/explaining): What are good tools to use for archiving web conversations (e.g., best way to archive Twitter conversations or best ways to create an archive for a conversation that spans multiple sites such as Twitter, blogs, and Tumblr)? 5. I’d also be interested to hear a bit from those of you who were part of THATCamp KY last year who are here again, both because I’m nosy and because it would be good not to repeat too much if there are several people who attended last year, too. 5" src="http://www.uky.edu/CampusGuide/images/0202.jpeg" width="295" height="241" />Probably the best spot is Parking Structure #5 (next to Kennedy’s Bookstore) – enter from either Limestone (near the pedway) or from Upper (after Bolivar Street intersection). That has guest parking, and it’s a pretty easy walk across the pedway up to main campus and then straight on to Little Library. Looking forward to seeing everyone at 2 p.m. today in the Niles Gallery. What are your favorite tools? Bring them! Let’s have show and tell. What tools do you use and how do you use them? As part of the session, we will collaborate to create an annotated list of tools on Google Drive.